This could be the simplest FM transmitter circuit you can find on the internet. Only using a single transistor and few passive components, this transmitter can deliver signals up to 50 meters. The transistor Q1 serves as the modulator as well as oscillator. Capacitor C2 and inductor L1 forms the necessary tank circuit for making oscillation. The voice to be transmitted is coupled to the base of Q1 using an electret microphone. The FM signal available at the collector of Q1 is radiated using the antenna. Use a 3V battery for powering the circuit. Coil L1 can be made by making 5 turns of 24AWG wire on a 1cm plastic former. Adjustments in the transmission frequency can be made by compressing or relaxing the coil. Antenna can be a 25cm long 18AWG wire. In your Circuit the signal is catch by mobile FM radio . If i change the supply voltage to 9V and also change the resistor of 4,7k. Wil the circuit deliver more power? and also more meters? sir,i am a beginner however i made this circuit and dont know what to do now….i searched the channel through phone fm and found nothing…plz help. Sir,Do it woak by mobile fm reciver? Just use the resonant frequency formula? Would that be okay? No other changes in the value of other components? Hi, sir. We have FM transmitter as our midterms project. But our professor said that it should transmit at an exact frequency. Say, 89.9. What adjustments should i make? its working and i choose a variable cap instead of capacitor in the tank ckt.. Thanks for ur valuable support..
what is the frequency range…? Please wind the coil as per data and use, trying to buy with uH value will not help you in completing the project successfully. It will operate in the range of 88 to 108MHz you can use your standard FM receiver to monitor the signal. i made dis miniature fm transmitter on a Veno board though with slight variation; i used 0.001uf instead of 0.01uf, 22pf instead of 33pf, 0.001uf instead of 6:8pf, and little alterations too wr made to d resistors. I did these bcos i could’nt lay my hands on d exact capacitors and resitors. Well, unfortunately for me it didn’t work. Pls i dnt knw why. Thought i could use some help from ya folks! I used 7 pF instead C3 6.8pF. When I do a scan with my phone no new radio discovered. Voltage on microphone is 0.7V (Electret microphone need 1.5V). I need to build this circuit, please help ! hi am saimtronics from Nigeria. when i connected the circuit it was working at 105.30MHz but now it is not at all working why is this so?????? i checked all the connections it was all right. Hi this a good and simple circuit, but instead of using a fix capacitor at C2, done u think a variable capacitor can be used there to vary the frequency instead of using the coil. And a C119 transistor can replace the Q1? Hi yes you can use a 4.7PF fixed capacitor with 22PF variable capacitor. 2N2222 is the best choice. you can try C119. will the above circuit given in the link work..
also suppose..if i only wnat to use a single band..that is fixed at one frequency..what value of inductance and capacitance should i use..?? Also any idea on how to simulate this in software..?? and the value of components example 10uf/16v. give us those title if we can build same. Can we replace electret microphone by 3.5mm port so that AUX cable can be used? 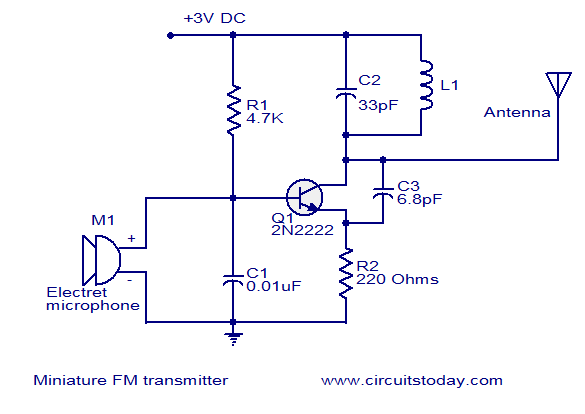 hi sir what is FM transmitter and receiver exactly?and can i use it to transmit music and receive.how to do that? can i use 7PF for x3 instead of 6.8pF? Thanks for this circuit ! Most oscillators I tried were not working. 1. It works for about 3metres without antenna. But if i insert the antenna, the frequency chages. what to do? 2. I assembled the circuit yesterday night and left it in a working condition undisturbed. I only disconnected the power. But today morning, the frequency is changed by itself! So, will it change like this? the plastic conduit.. the flexible one or rigid one? Can you refer an image? Hi Anish 1cm dia (10mm plastic conduit used for electrical wiring). What does “1cm plastic former” signifies? If i am right, is it the coil core? and 1cm diameter or radius? Hi Sarah, Vysakh increase R1 to 10K use 2n2F as coupling capacitor as decoupling is 10nF coupling should be at least 1/5 of this value. use signal from head phone socket of Laptop and use its volume control for modulation level such that transmitted audio signal is clear. does this cct really work? I want to try it.pls I need necessary. information about it. @sarah , you can use it through a 0.1mfd ceramic filter capacitor. I already checked . @seetharaman , this circuit produces some noice and audio quality not good as i expected with condenser mic. I think a pre audio amp shold provide in this circuit. Not for a microphone seetharaman. If i want to send a signal from my laptop. To play music or something. Wouldnt ah headphone female jack work using this same circuit? Hi Sarah you have to use electret condenser microphone. Moving coil microphone will not work. Can I use a 1/8 inch female headphone jack instead of the microphone? Hi Rick it is the feed back capacitor for oscillation, without which the circuit will not oscillate. Is C3 used for Frequency Stability of the Transmitter?? Awesome Circuit!! Simple and Fun to Build!!! Yee-Ha!! But, i am gettin proper reception within one metre only…. S der any problem with the inductance coil..? Am using a single stranded insulated copper wire… Or any problem wit d antenna? I am using ordinary insulated wire of length 25 to 30 cm… Whether the small increase in length matters a lot? Hi Jack 50 to 100 feet. your circuit is useful and needed by many person’s involved in technologies i need some addition information because me also i want to get knowledge from those. Yes Anish you can use. Hi Hengilbert yes you can use 2 to 33PF FM radio plastic trimmer capacitor can be used for C2. C2 is a trimcap….if it is,can i use 30 or 40? Hi Sam you can use insulated single strand hook up wire which will be around 20SWG, that will be ok.
Hi… I cant find this wire 24AWG and 18AWG wire in my area… So can you please tell me their alternatives which are easily available in Market.. Please reply..
it is very good circuit.i have worked with this circuit.but i used 9V to operate this circuit .thank you. Hi Jayaprakash these transmitters can operate in VHF range can be fixed in FM Broadcast Band (88 to 108MHz) We can tune first our receiver to a frequecy where there is no broadcast station. Now switch on the above transmitter, with a fibre rod expand or compress the 5 turn coil till you get the feedback howling. Now keep the transmitter near a sound source, which you want to transmit and try to listen by fine tuning the receiver and relax. at which freq this circuit operates.